Most international visitors that come from overseas don′t spend all of their vacation in the same spot. They usually want to combine several highlights in Central Europe in as little time as possible. Popular destinations for a combination with Salzburg are Innsbruck, Vienna or Munich - as well as Graz. 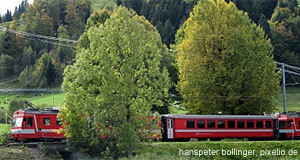 In the past, readers of Visit-Salzburg.net have e-mailed us regularly to ask about public transportation and the best mean of transport between Salzburg and Graz. There are several possibilities to pass the almost precisely 300 kilometres between Salzburg and Graz, but there is something crucial to keep in mind: There are the Alps in between. Therefore, the traffic routes between Graz and the regions north of the Alps are generally of a kind that allows only painfully slow progress. Nevertheless, getting from Graz to Salzburg or the other way round is no big hassle. We have looked into various options for travelling. Surely the most convenient mean of transport. Trains depart frequently and there are direct links between the two cities. The trains link the main stations of the two cities rather conveniently and run typically every two hours during weekdays. These direct trains between Graz and Salzburg more than four hours, which is a long time in comparison with similarly long rides through non-Alpine areas. The cost for a one-way ticket with no discounts is about 50 Euros. For young travellers, rail passes that are valid for several weeks (Interrail) in all of Europe might be the best offer, especially if you travel to other destinations besides Salzburg and Graz, too. We don′t know of private companies that operate long-distance journeys from Graz ro Salzburg, but public busses are no real option. They would involve multiple changes and in turn an unbearable investment of both time and money. Trains will be your number one option of public transport. The airport of Graz is small and cosy. There are some low-cost airlines that go there and private aircrafts that might link the airport with its equivalent in Salzburg. However, we don′t know of any direct scheduled flights between Salzburg and Graz. Plan to drive about three hours and 15 minutes from Salzburg without breaks. Note, however, two things: Driving from Salzburg to Graz or the other way round means that you will pass some of Austria′s most scenic spots, particularly in the Salzkammergut. That means that you are not only likely, but also well-advised to stop. Plan additional time for that. Secondly, note that some sections of the motorway north of Graz are toll roads; consider this additional cost if you want to use these roads in your planning. For car rentals, the same thing can be said in this article as in those on links between Salzburg and Munich or Salzburg and Vienna: There are of course all the major car rental companies present in Salzburg and Graz and they will make you their usual offers. Taxi and shuttle services will be expensive, but are on offer for both directions. Just enquire with several taxi companies, since fixed rates might be negotiable to your advantage.